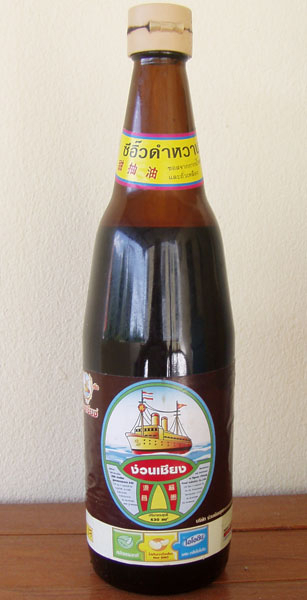 Thai "dark and sweet" soy sauce is similar to the dark Chinese soya sauce, a darker and slightly thicker soy sauce made from light soy sauce. This soy sauce is made through prolonged aging and added caramel color, and may contain added molasses to give it its distinctive appearance. This variety is mainly used during cooking, since its flavor develops during heating. It has a richer, slightly sweeter, and less salty flavor than light soy sauce. Dark soy sauce is partly used to add color and flavor to a dish after cooking, but, as stated above, is more often used during the cooking process, rather than after.